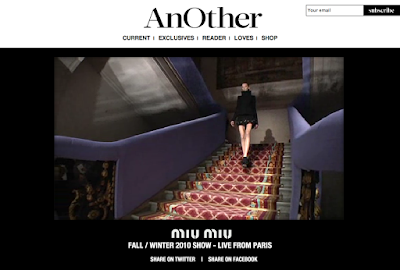 I was lucky I got the magazine's newsletter right on time for the live-stream, as Miu Miu presented its collection live trough AnOther on Wednesday. There were a few glitches and jumps with the live feed and it wasn't in HD, but all and all it was a nice experience. The collection was all about black, purple and orange..... more sober, but still girly! Pre and post show, you could see guest arriving or leaving, taking their seats and listen to them talking (at the end I even heard some Italian conversations), it wasn't so entertaining.... but you could always just leave the page open and go about your business until the show began. But in its simplicity, it was nice to see what was really happening there (authenticity? ), instead of Burberry's "Pre-show PR pitch.... which felt rehearsed and forced, and detracted from this otherwise brilliant iniciative" as Imran Amed from the Business Of Fashion called it on its Burberry 3D Live Stream article. About Live-Streams: On a recent article from WWD- Streaming the Future, the publication asked a number of industry leaders (Retailers and designers like Ralph Lauren, Karl Lagerfeld, Miuccia Prada and Karen Katz CEO of Neiman Marcus) what they thought about the future of The Fashion System and Technology. "Do you think that live streaming is going to become the norm? It feels like it's already that. 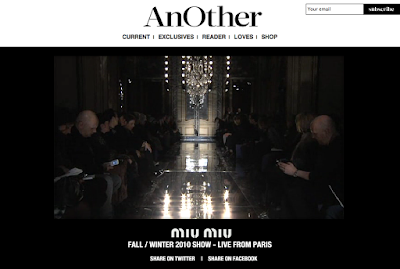 From seeing McQueen live stream last season, and then all of a sudden this season, 20 designers did it. It's almost like everyone is already doing it and it feels kind of old already. 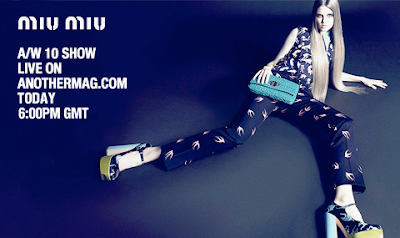 It might become one of those things, like you need to do a look book, you need to live stream". I think it's right on the spot, and I couldn't agree more. ".... Buyers and the press have been priviledged and blessed to be in this little club, but now the consumer is in the room with us, and everything has changed".